I swear it’s got to be one of the greatest feelings a (non-pornographic) film can give you. Whilst watching “The Shawshank Redemption” I was very aware that I was in the company of brilliance. It’s that almost indescribable quality something has when you just know it’s really, really good. I get the feeling I don’t need to tell you the basic plot as apparently I was the only person on the planet who hadn’t seen it. However, just in case, I’ll give you the lowdown. 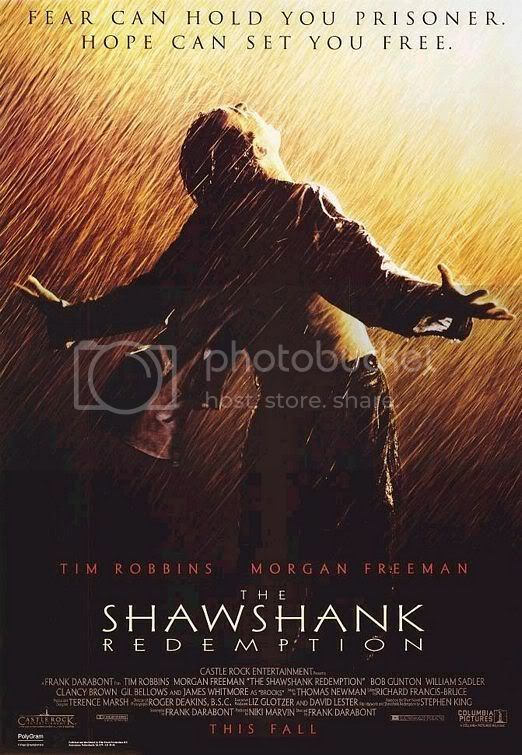 The plot is based on the Stephen King novella “Rita Hayworth and the Shawshank Redemption” and follows Andy Dufresne (Tim Robbins) as he is imprisoned for the murder of his cheating wife and her lover. Andy is carted off to Shawshank, probably the worst prison to ever exist to serve out a life sentence. Whilst in prison, Andy eventually befriends Ellis “Red” Redding (Morgan Freeman) a man who he’s heard can “get things”. As the story goes on, Andy asks Red to get Rita Hayworth for him. The story is engaging and simply fantastic. I was really caught up in it all. Shawshank is presented as a horrific, cruelly unfair place. The thing I loved most about the film, apart from some truly great dialogue, was the relationship between Andy and Red. It’s presented with a degree of subtlety that you just don’t see these days. I really like the fact that their friendship feels real, rather than forced for the plot’s sake. Of course, most of the accolades for this can be placed upon Tim Robbins and Morgan Freeman who play the characters with such skill that it’s impossible not to like them. It’s very, very easy to point out when a bad film turns bad. You can pinpoint it with laser-guided accuracy. However, it is extremely difficult to pinpoint when a good film becomes a good film. I’ve tried to pin down what makes “The Shawshank Redemption” so good, but have been unsuccessful so far. I think it’s the overall quality of everything combined. The acting and dialogue are stellar for one. Every character that’s introduced is well fleshed out and given something to do, which is something most films can only dream of. The ending has got to be one of the most satisfying (non-pornographic) endings ever. It’s incredibly well done, avoiding the mawkish and cheesy traps that most films fall into. The best thing about “The Shawshank Redemption” however, is more of a personal thing. It has proved to me that even after watching films for years and years, I can still be blown away by the exceptional few. If you haven’t guessed by now, I give this film a full five stars.